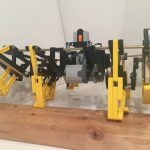 After teaching a challenge-based LEGO Engineering class for two years, I wanted to offer a really difficult challenge for a dozen of my most motivated students (grades 6-8). 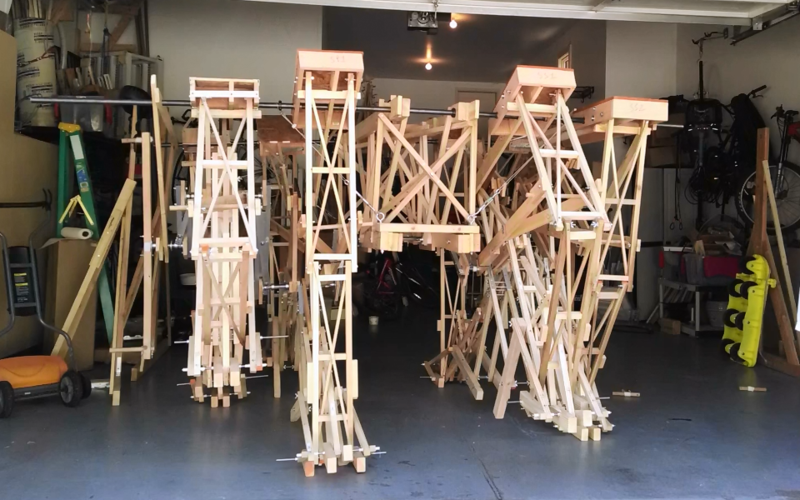 I settled on linkage-based walkers, like Theo Jansen’s Strandbeest. Rather than copy prototypes or plans, I had the class study various linkage mechanisms, their trade-offs, and how they can be implemented into robots of their own design. While a more difficult path, this led to deeper understanding, and ultimately to a second stage of the challenge the following year where we built a minivan-size robot using a new leg mechanism we developed. If you want to skip to the end of the story, we posted highlights of the TrotBot project here. If you want to read how this challenge evolved from my more standard LEGO Engineering classes, read on. Exploration of various straight-line linkages by prototyping in LEGO Technic beams, allowing students to rapidly modify the configurations to test the effects on the curve drawn by the end of the linkage. This was assisted by taking a Bic pen out of its plastic sleeve to pass through the beam’s final hole, allowing students to draw many curves to compare configurations. The following image shows an example of using a Bic pen to draw the foot-sweep of Klann’s leg mechanism, and examples of how changing bar lengths affects Klann’s foot-sweep can be seen at Klann’s site. Students also used Mekanizmalar’s simulations as guides for prototyping linkages with Technic beams. After a decision was made on what linkage the student wished to use, we then had a few basic robot classes on gear trains, crank/axle systems and the transfer of torque, frames (which had to support the geometry of the chosen leg mechanism, gear train and motor, and how to incorporate triangles for strength with little weight), etc. Several classes of robot assembly. 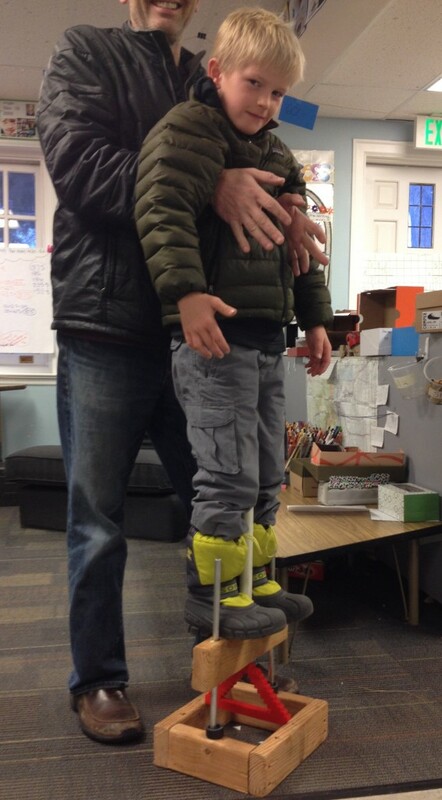 Building walkers can be really frustrating, perhaps too frustrating for many students. Like building a finicky Swiss watch, if the linkages are not spaced properly they will lock up. Playtime by running the robots on obstacle courses, which was in reality the final testing of the students’ chosen mechanism and builds, and also allowed us to compare the performance of a few different mechanisms such as Klann’s Mechanical Spider and Jansen’s Strandbeest. Because we approached this challenge from basic principles, we ended up developing a few of our own walking linkages. One of them was designed to have a high foot sweep, and performed better on the obstacle courses than the other walking machines. This linkage led to Stage Two of the project the following year. Stage Two: Let’s go BIG! Stage Two involved scaling up a robot with this high-step linkage to the size of a minivan. This was, to say the least, an ambitious expansion of the challenge, so why did I propose it? 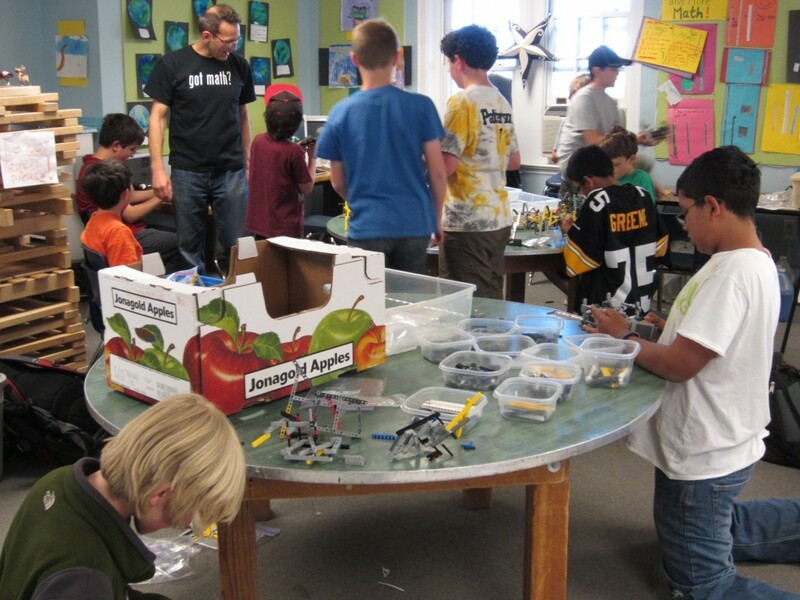 In addition to allowing the students to apply what they had been learning with me the previous three years, I think I was personally motivated to test what I’d been teaching, to see how well the principles taught at LEGO-scale worked at large-scale. Can LEGO-scale engineering translate to minivan-scale? 1. Of course, you have to either make the parts or have them fabricated. If you plan on having parts fabricated with CNC, laser cutting, etc. try to get quotes in the initial stages of your project. In our case the prices to have the parts fabricated were too high, so I had to make them on my drill press, adding significantly to the project’s time requirements. 2. Like the old carpenter adage, “measure twice, cut once”, really think through your design before making your parts. LEGO is such a wonderful learning medium as design modifications are easy to make, whereas changing fabricated parts often requires making them anew. As we discovered in our first walking test, we should have gone with our 12-leg version rather than the 8-leg version, but changing to 12 legs would have required making too many new parts. 3. If possible, try to engineer some flexibility in how your parts can be configured, so that some modifications can be made without the need for new parts. 4. 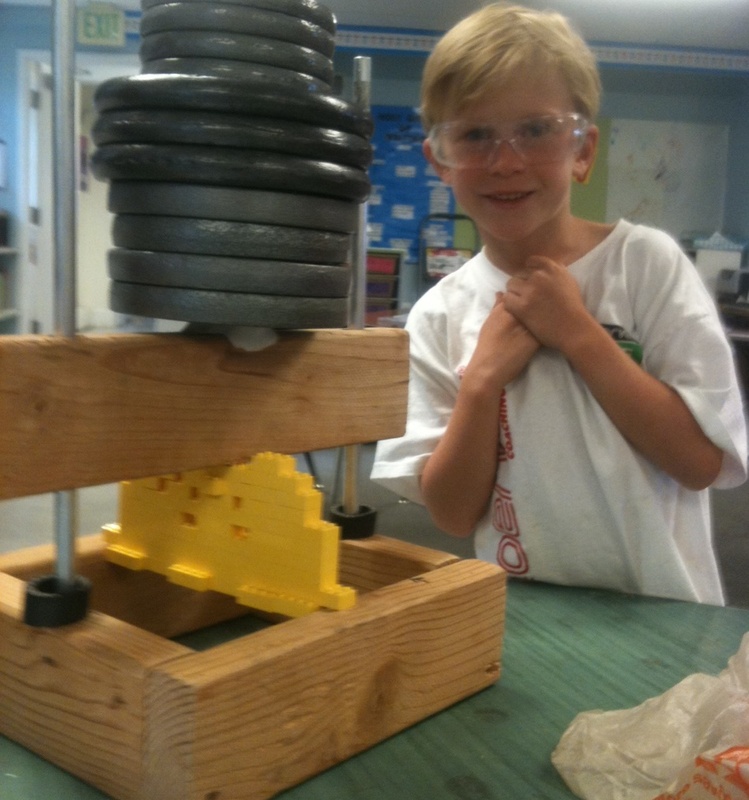 Anticipate how lower strength to weight ratios will require design modifications. In our case we anticipated most of these issues, but not all of them, requiring us to add structure to increase strength, which added more weight to an already heavy machine. What was learned by scaling up? One benefit (problem?) of scaling up is it magnifies any issues with a design, providing feedback for fine tuning that is not available at LEGO-scale. I won’t go into the details here, but the scale-up yielded much useful insight into how the machine can be improved. 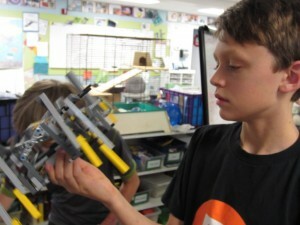 What sorts of LEGO engineering challenges proved useful during the scale-up? Of course, the biggest issue with scaling up is reduced strength-to-weight ratios, and I thought we were well enough prepared to deal with this. My LEGO Engineering challenges include a few on basic statics, such as bridges and cranes where the students’ builds are tested for failure weight. I structure these challenges to minimize reliance on the strength of the LEGO parts, and instead to test the students’ designs, hoping to impart basic principles that apply to engineering at scale. To illustrate, following are brief descriptions of my bridge and crane challenges. In my entry level bridge challenge, each student gets a cup of bricks (about 50, no larger than 4×2, bricks to prevent bridges from relying on the strength of a long brick). 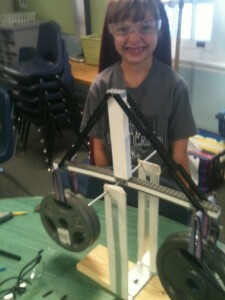 My bridge tester spans 8 1/2 inches so students’ bridges need to be as long as the width of a piece of paper. At the beginning of class, I prime them on the inherent strength of triangles with a puzzle. I give each student a square made of four Technic beams with the challenge to make the polygon stable by changing its shape, with the solution, of course, being to remove one beam and form a triangle. However, I don’t show them how to build a triangular or arch bridge with bricks, as they much prefer to figure it out on their own. 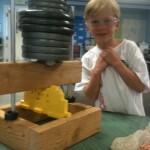 Typically, students first build flat beam bridges, which fail at maybe 2 pounds on the tester. All testing is done during class (with much theater as the weight plates clang loudly when bridges collapse) and I call attention to the rest of the class when a new design is being tested, allowing the entire class to benefit from what is learned from the test. 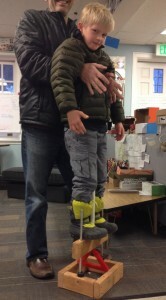 In this trial-and-error fashion, the students eventually home in on a triangular-based design that holds all 50 pounds of the bridge tester, and younger students usually insist on their favorite test of standing on their bridges. The next bridge challenge is the more complicated truss bridge challenge using a limited number of Technic beams. In this challenge, I don’t allow flat beam bridges to be tested as that would simply break the beams. Since the students have already completed the brick bridge challenge, they know strong bridges will utilize triangles, and eventually create all sorts of crazy truss bridges. The additional trick they need to figure out with truss bridges is symmetry, otherwise their bridges will fail by twisting. Of course, during testing I invite students to speculate on why bridges held more weight, or failed, and many eventually get to the level of understanding that triangles convert bending forces to tension and compression, and can identify which members of a triangle-based bridge are under tension or compression. For more information about the bridge tester, see “How to build and safely use a bridge tester”. Cranes utilize triangles in the same way as the bridge challenge. I’ve attempted to “lecture” via Socratic questioning on how a crane’s triangular design converts bending forces to tension and compression, but have found this to be too abstract for younger students. Much more effective is prototyping in LEGO coupled with a few guiding questions. In the following crane challenge, students in grades 2-5 actually taught me how to build the first crane while I stood in front of class by answering a series of questions on how to fix my flat beam crane, which I broke at the center (where the stand’s axle passes through the crane) by gently pushing down on each end. Me: “OK, like with these loops of rope?” (as I lift the ends). Note: I chose rope to emphasize that these members will be under tension. Note: The class intuitively grasped the tower would be under compression, which bricks handle well. I think this was one of my favorite classes. After telling me how to build the crane properly the students couldn’t wait to build their own, and within an hour there were a dozen Golden-Gate-Bridge-like structures in the room, with very few additional clues needed from me. Since we had spent so much LEGO Engineering class time on building strong structures with triangles, we were able to design much of our minivan-sized robot in our heads. Trickier problems were given to the team as homework assignments, which we would then debate as a group, and all engineering design decisions were made during such debates – my only dictatorial role was with the budget. An example homework question asked the team to consider how to efficiently support the robot’s two weight-bearing rods that extend 4 feet out from the frame. The team recognized that only tension was required, so chose “weightless” cables to connect the rods to the frame, creating a triangle. A trickier one asked them to figure out how to ensure our transmission’s cranks maintained right angles to the axle. Here they came up with a trussed design and I was able to implement a variation of it on my drill press. 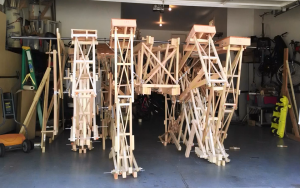 We exhibited “TrotBot”at Denver’s Maker Faire in June 2015, and it was a hit, both for the size and sheer geekiness of it, as well as being the only Makers with a team of kids doing all the assembly of a very complex display. I live in Denver, Colorado and I'm a data scientist, so I primarily work with bits, but I rediscovered the joy of tinkering with atoms by teaching a LEGO Engineering class. 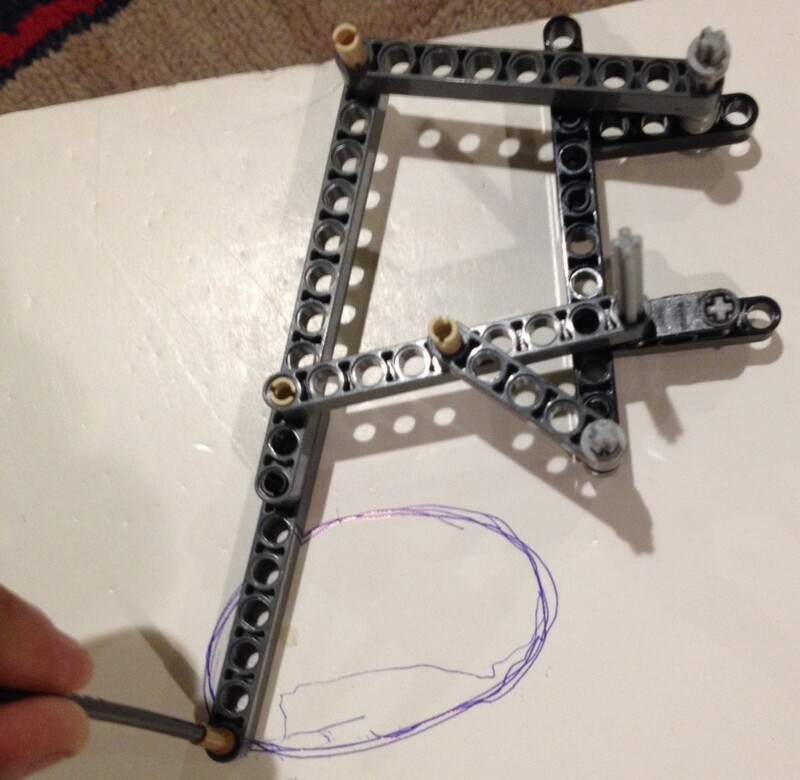 My students and I use LEGO to explore physics and simple machines, from catapults that hurl tangerines, to gliders that fly 50 feet, and occasionally I invite my LEGO Engineers into my garage to scale up their creations!